Living in an area with hard water can be super frustrating. You feel like you are constantly cleaning your kitchen and bathroom. Finding a solution for those irritating hard water stains is generally an unwanted task. Keep reading to find out more of what hard water is, how to distinguish between soap scum and hard water, and how to remove these unwanted hard water stains. Hard water is water with a high concentration of mineral deposits. It can cause a build-up on your faucets, and fixtures as well as any of your other appliances that use water like your dishwasher, and coffee pot for example. Hard water can cause an unattractive film over your glass shower doors, tub, and sinks. If you are unsure if you merely have soap scum, or bothersome hard water builds up simply use your fingernail. Take your fingernail and run it across the stain, if you can scratch it away, then it is soap scum if it still remains it is hard water buildup. The quickest way to remove hard water stains is with a professional strength limescale remover. These can be purchased at most home improvement stores or a professional cleaning supply store. Be sure to read the directions and warnings on the back of the bottle before applying the product in your home. Let the product sit a few minutes before wiping it away. Depending on how severe your hard water stains are, it may take more than one application to eliminate them. Be sure to thoroughly rinse the area after each use to ensure all the chemicals from the product are removed. If you are a health conscious person, you may worry about all of the chemicals a limescale remover may have in it. Many people want to use “green” products and would rather try a more natural approach when cleaning their home. Vinegar is an excellent cleaner, and I’m betting the majority of people have it in their kitchen right now. Hard water stains are tough to clean so using non-diluted vinegar is preferred. Add vinegar to a spray bottle and apply to the stains, let this sit for about five minutes then wipe away with a cloth and rinse with water. You may have to repeat this several times depending on the harshness of the stains. Living with hard water can be tolerable with these simple tips, but if you live in an area with extremely hard water, it may be wise to invest in a water softener unit or treating your water with softening agents. 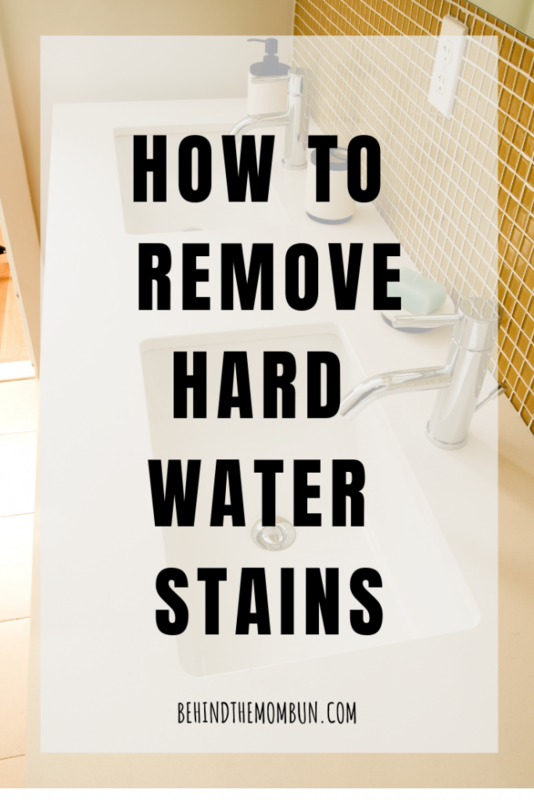 The post How to Remove Hard Water Stains appeared first on Behind the Mom Bun.